Make like the model and pair with a sparkly statement necklace. Emera tank, $42 at Shop Sosie. 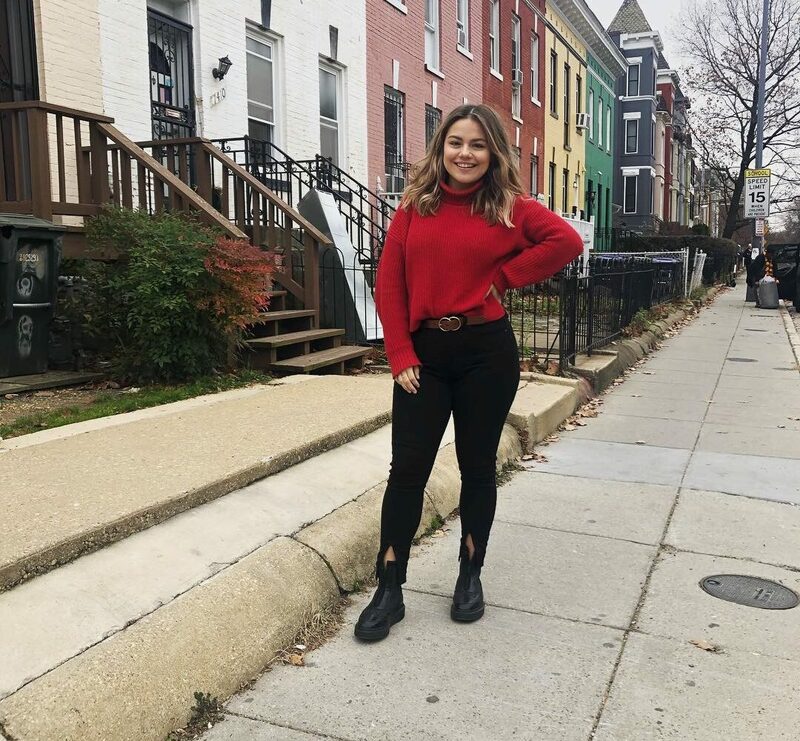 Belt it, tuck it in, wear it loose—the possibilities are endless with this versatile blouse. 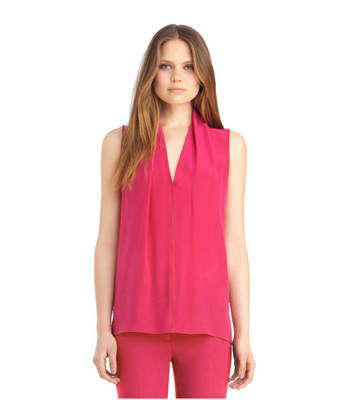 BCBGeneration pleated sleeveless top, $98 at BCBG. 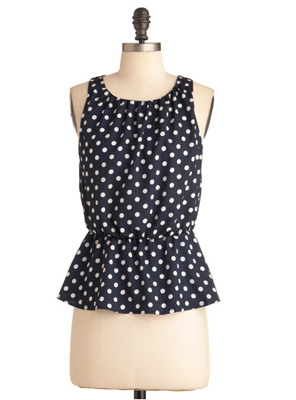 The high neck on this polka-dot peplum style tones down the playfulness. She’s Got Peplum top, $32.99 at Modcloth. A pretty wrap blouse with just a hint of shimmer. Aqua lurex dot cross-front shirt, $69 at Bloomingdale’s. 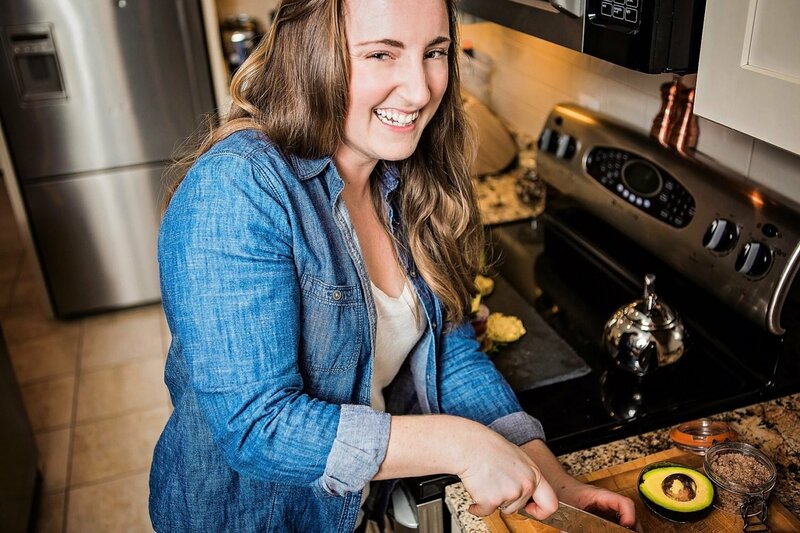 Go really bold by pairing with a kelly-green bottom. Tulip tank, $55 at Pixie Market. Marni. For under $130. Jump on that, people. 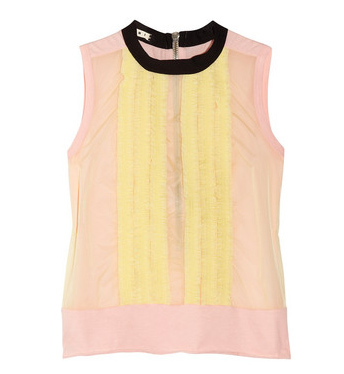 Marni ruffled shell and jersey top, $128 at the Outnet. Ignore the nonexistent shorts—this full-coverage blouse is office gold. 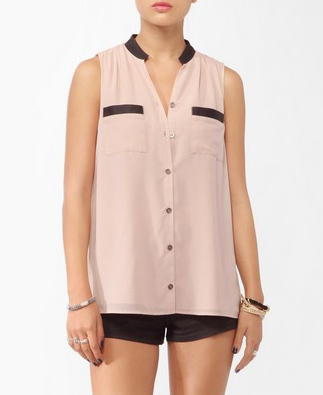 Twisted chiffon tank, $38 at Nasty Gal. Get a head start on fall trends with this colored lace shell. $98 at Ann Taylor. A simple, streamlined statement-maker. 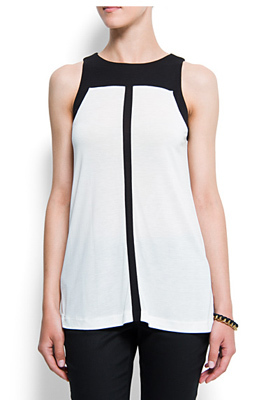 Two-tone straight-cut T-shirt, $34.99 at Mango. 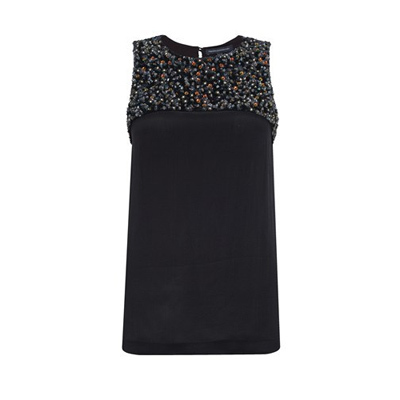 A bit of sparkle breaks up a solid black tank. 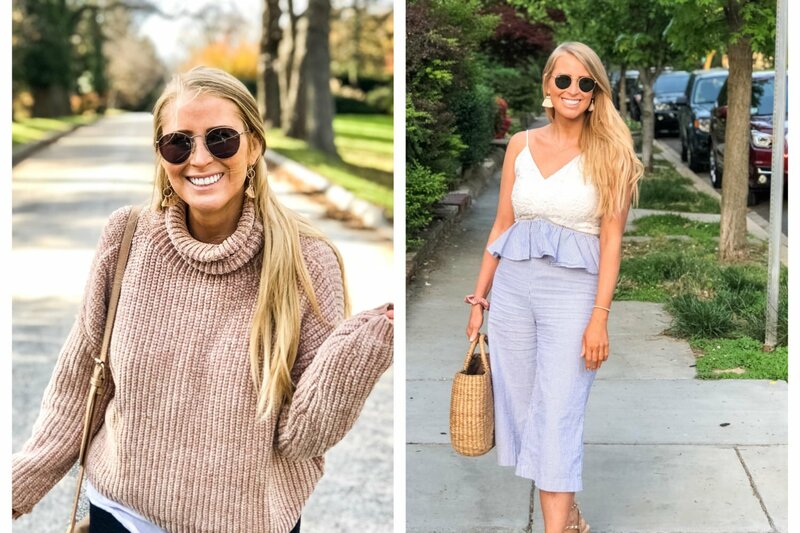 Moondust vest top, $198 at French Connection. 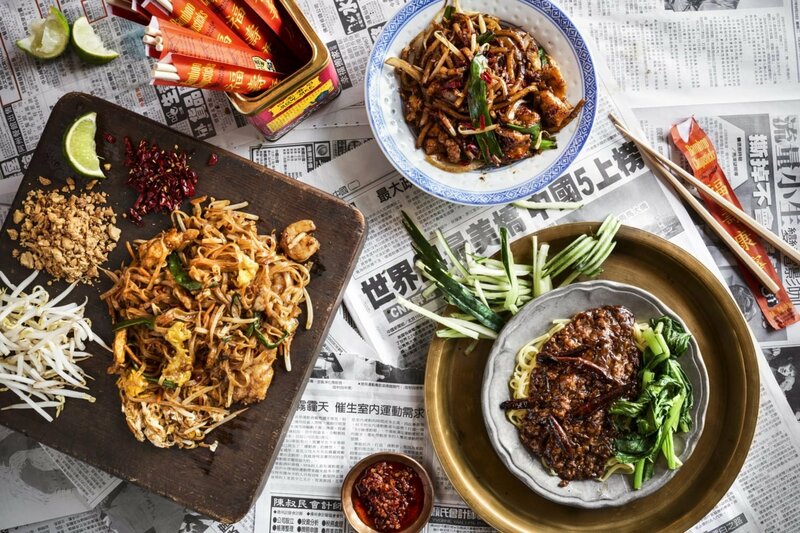 Works just as well for a dinner out with your folks. 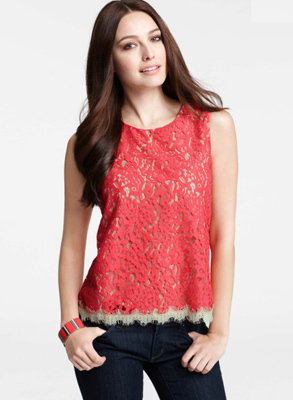 Tinley Road neon beaded-neck top, $38.99 at Piperlime. Faux leather trim is a subtly intimidating detail. $19.80 at Forever 21. The jeweled seam is a fun detail. Collective Concepts jeweled tank, $69 at Piperlime. 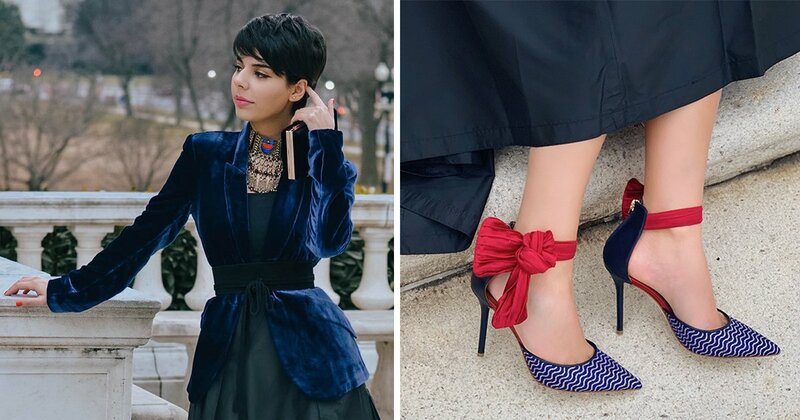 A modern take on Mad Men style. 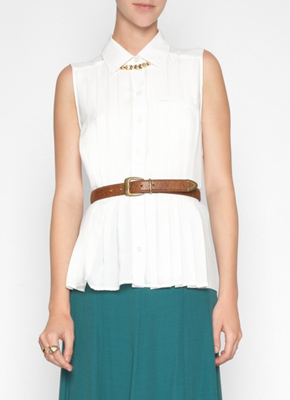 Ladakh Vintage Muse top, $92 at South Moon Under. A simple shape in a stand-out color—you’ll wear it forever. $198 at Rachel Roy.